Suffer from hip issues? Want to have a more stable body and hips and get rid of the cellulite that you got behind your thighs? This 3-session hip series is all about getting ready for summer - on the inside and outside! 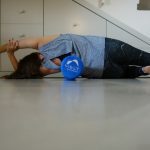 Hip stability will be a focus in this workshop as well as Cellulite Challenge where you commit to 30 days of melting once per day and see how your skin gets smoother. Come join MELT instructor Liron Weiss to learn gentle and profound MELT moves to stabilize your hips, plus, join the 30-day Cellulite Challenge and repair the damaged in your superficial connective tissue. Learn how you can stimulate the superficial tissue to generate and circulate more fluid, creating a better barrier to keep the fat from being visible on the back of your thighs. Liron will provide the rollers in class but if you are part of the Cellulite challenge you will have to have a roller at home to practice every day.